If 2007 was Year Zero in the life of the Phone That Changed Everything, then 2008 skyrocketed forward to the year that the device truly came of age. A lot has changed in the world of Apple’s handset since our first glimpse of it almost two years ago at Macworld Expo 2007, and while the iPhone has climbed to even greater heights of success in the past year, the road hasn’t been without its fair share of pitfalls and potholes along the way. At Macworld Expo last January, Steve Jobs took the stage to dish iPhone sales figures. At that point, the original iPhone had sold about 4 million units, capturing around 20 percent of the U.S. smartphone market. That was impressive for a six-month-old phone, but throughout the year Apple executives repeatedly reaffirmed their goal—originally set by Jobs during his 2007 Macworld keynote—of selling 10 million iPhones in calendar year 2008. With the original iPhone, that goal might have been a bit lofty, but as the year progressed, it quickly became apparent that Apple had, as usual, given a number it expected to hit. Among the major factors in boosting the iPhone's sales were the introduction of the iPhone 3G and the App Store (which we’ll get to below), but 2008 was also the year the iPhone became truly a global phenomenon. As of the beginning of 2008, Apple sold the iPhone in only a handful of countries: the U.S., the U.K., France, and Germany. Austria joined the club last February, followed by Ireland in March. That trickle turned into a deluge when, during the keynote at June’s Worldwide Developer Conference, Jobs announced that Apple planned to add 70 countries to the iPhone’s market by year’s end. And Apple delivered on that goal—the iPhone is now available in around 75 countries, with more still on their way. The most prominent omission remains China, where Apple remains in back-and-forth negotiations with the country's largest wireless operator, China Mobile. All that expansion helped catapult the iPhone to its goal of 10 million, which Apple reached toward the end of October. That wasn’t the only big number the company hit along the way: in a rare appearance on the company’s quarterly conference call with stock market analysts in October, Jobs announced that Apple had shipped more units than Blackberry-maker RIM in that quarter, and that its revenue put it in third place for mobile phone suppliers. In early November, market research firm NPD Group said that the iPhone could stick another feather in its cap: namely, beating out the popular Motorola RAZR to become the top-selling handset in the U.S.. It didn’t hurt that in addition to selling the phone at Apple and AT&T stores in the U.S., the handset was also available from electronics chain Best Buy starting in September and retail giant Wal-Mart as of the end of December. Apple also took another unusual step in its October conference call. In order to comply with Generally Accepted Accounting Principles (GAAP), Apple had long tracked iPhone revenue in a “subscription accounting” method, meaning that the company recognized revenue from the sales over the expected lifetime of the product, which in this case was 24 months. While that helped keep Apple from running afoul of tricky regulations governing accounting, it had the side effect of concealing just how well the iPhone was actually doing. In that same October conference call that featured Jobs, the company announced that it would also begin providing a separate set of numbers that would more clearly represent the iPhone’s impact on Apple’s bottom line. That impact was staggering: had the revenue not been deferred, the iPhone would have accounted for 39 percent of Apple’s total revenue for the company’s fiscal fourth quarter of 2008. Clearly, as Steve Jobs noted, Apple’s iPhone business has become too big to ignore. The original iPhone may have been a marvel of engineering, but Apple’s never one to rest on its laurels. And so as last June's Worldwide Developer Conference approached, whispers that a new model of iPhone was on its way became more and more common. 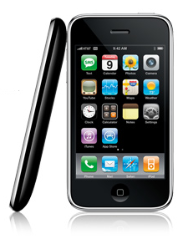 That model, the iPhone 3G, was unveiled by Jobs during the WWDC keynote. Externally, the revamped phone looked a lot like the existing model, although the silver metal back had been replaced by a slightly curved plastic one available in either black or white. The changes were mostly minor inside, too: a 3G wireless radio was the marquee feature, along with an integrated GPS unit, and the storage capacities had been bumped to 8GB and 16GB. Gone too was one of the biggest hardware shortcomings of the original unit, the dreaded recessed headphone jack. Then there was the price. When Apple rolled out the first iPhone, many were critical of the high price tags of $499 for the 4GB model and $599 for the 8GB model. When Apple dropped the price of the 8GB model by $200 and discontinued the 4GB model in late 2007, early adopters started crying bloody murder. But the news that the iPhone 3G would lower the price of entry even further, $199 for the 8GB model and $299 for the 16GB model, was greeted with widespread approbation. Suddenly, the iPhone was priced comparably with far less capable handsets—well, unless you included the hiked cost for AT&T’s service plan, which actually made the bottom line slightly more expensive. But despite the much touted 3G technology, the improvements in the new iPhone were not quite as widespread as many would have liked. Tests showed that in some places the 3G didn’t quite meet the touted “twice as fast” mark, with one Apple commercial even being slapped down by Great Britain’s advertising watchdog group. But while a slick exterior is all well and good, sappy Hollywood movies have taught us that it's what's inside that really matters. The iPhone’s software has always been its most important differentiator. Based on the same OS X foundations that run the company’s Mac offerings, the iPhone OS shows attention to design and detail unparalleled in the mobile phone market. And Apple is constantly improving upon it. The year's first iPhone update, released at Macworld Expo last January, added location services to the Maps program, multiple SMS recipients, and an editable home screen. But the big software event of the year was the iPhone 2.0 update, first announced at a special event in March 2008. iPhone 2.0 aimed to fill two major gaps in the iPhone’s arsenal by adding enterprise features like support for Microsoft Exchange, and introducing a beta Software Developers Kit that would allow third-party developers to create programs for the iPhone. The latter had been promised by Steve Jobs back in October of 2007; up until then, developers had only been able to create Web applications for the iPhone, while users who wanted native apps resorted to jailbreaking their phones. Applications developed with the SDK would be sold through Apple's App Store, which would be accessed via iTunes or on the iPhone itself. The release of the beta SDK was greeted with excitement by the developer community, which immediately started to work on applications in droves. Speaking at the March event, Jobs said the full iPhone 2.0 software would be available to consumers in late June, for free, though the initial release was plagued with instability issues that wouldn’t be resolved until version 2.1 hit the scene in September. The App Store would quickly become not just the wind beneath the iPhone’s wings, but a major source of contention as well. Apple has never really scored high marks in the “plays well with others” category, and developers quickly found themselves running into walls, suggesting that Apple had perhaps not thought through the entire process. The SDK’s non-disclosure agreement, for example, prohibited developers from discussing the technical details of their work on the iPhone with anybody else—even others who were bound by the same agreement. Apple’s approval process for the store began to look increasingly like a black box as applications started to get rejected for often unclear reasons. And App Store reviews were flooded with customers complaining about high prices, even when they hadn’t bought the applications in question. To its credit, Apple listened. In October, the company announced that it was amending the NDA to allow developers to publish and discuss information about iPhone development. Apple also updated the process for customers reviewing applications on the store, requiring them to have bought the application before providing a review. The approval process, however, has remained a strictly hit-or-miss affair. And Apple has failed to follow through on some of its promises: for example, the push notification system that the company said would be available in September still has yet to materialize, three months later. Despite those shortfalls, App Store business has boomed, with thousands of apps becoming available less than two months after launch, and 100 million applications downloaded; another two months and that number hit 300 million, with more than 10,000 applications available in the store. There’s no disputing the iPhone became an instant icon in 2007, but while some phenomena quickly burn out after the initial hype, the iPhone has shown that it’s here to stay. The introduction of the App Store helped the phone make the jump from merely being the “it gadget” of the moment to a full-fledged platform that may already rival the Mac in Apple’s affections. With all that the iPhone has achieved in 2008, it’s hard to imagine what’s still in store for us in 2009, but it’s probably safe to say that Steve Jobs still has plenty of surprises up the sleeves of his black turtleneck.